How Strong Should a Server Handling Lift Be? Strength refers to “the ability of something to support a force or weight without breaking,” according to the MacMillan Dictionary. But, when we refer to the strength of data center lifts, we’re talking about their ability to perform at their best. Can the device handle servers to carry out the three baseline functions of a data center lift? How strong should a data center lift be? You want a lift that’s strong enough to allow a single IT tech to carry out all of these functions safely with your heaviest server. 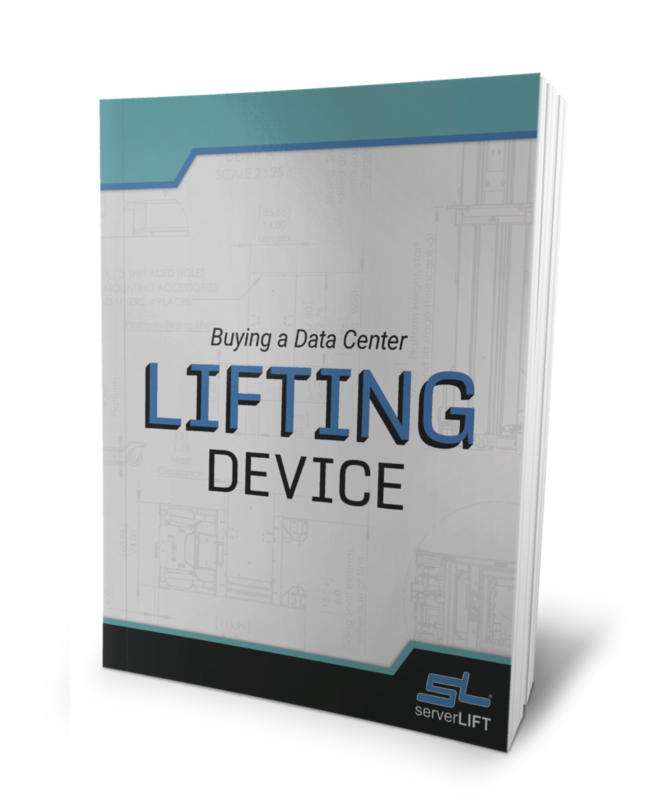 Using a data center lift that’s strong enough, one person should be able to lift, transport, and install or remove a server, without any help. How strong does a server handling device need to be, to be able do that? A data center lift should have a weight capacity rating greater than your heaviest server or switch. If you plan to move several pieces of equipment at the same time, the lift should have a capacity larger than the combined weight of those pieces of equipment. Suppose that you have a 75-pound (34 kg) Lenovo 5462EDU server that you move frequently. You also have a modular blade or switch chassis system, such as a fully populated HPE BladeSystem c7000 or a Cisco Nexus 7000 18-Slot Switch, each of which can weigh 500 pounds (227 kg) or more. You know that your tech can safely install the 75-pound server by hand with help or on his/her own with a light-duty lift. However, if you want your tech to do their work without the help of another and also be able to move the chassis system as efficiently as possible (without having to remove some or all of the blade or system components), you’re going to need a strong lift, rated somewhere between 500 and 1,000 pounds (227 – 453.5 kg). That’s how strong a server handling device must be to meet the challenges you face every day when operating your data center. 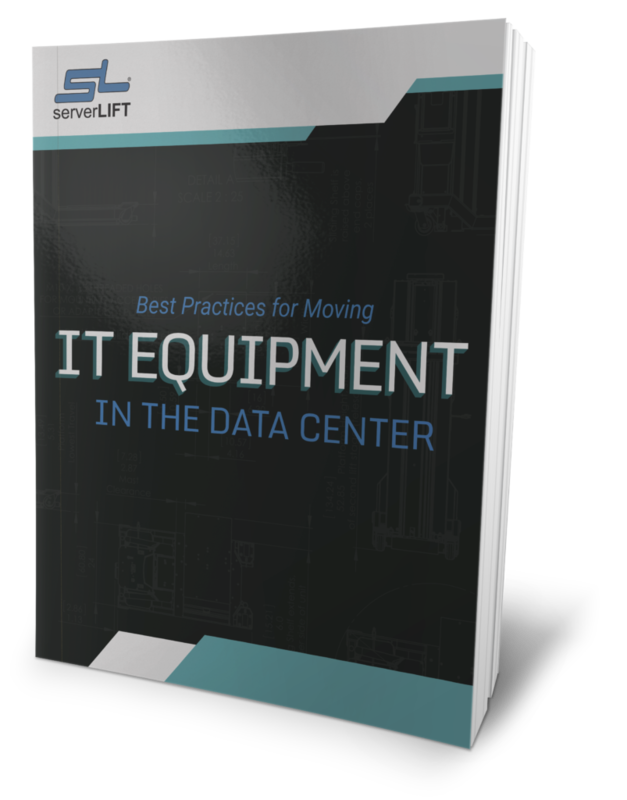 If your data center lift weight capacity rating exceeds the weight of your heaviest equipment, your IT tech will never need help lifting, transporting, or installing or removing a server. When dealing with smaller, lighter rack mounted equipment, strength still matters. Even when steadying a 35-pound (16 kg) server inside a server cabinet, attaching it to its mounting hardware with the other hand is an Olympic feat. 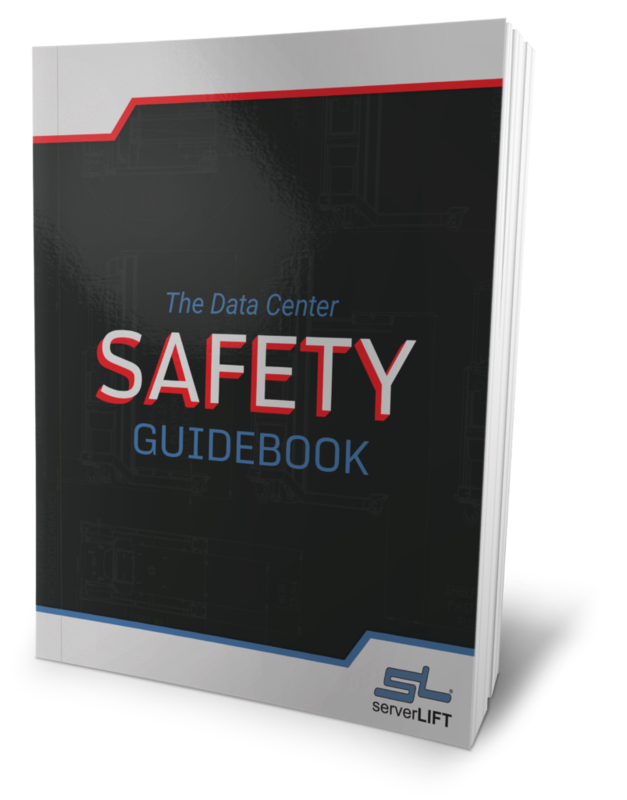 Even if it can be done, a data center lift can do that same job, safer, steadier, and better. Why Pay Three Employees to Do the Work of One? As data center technology advances, techs must handle more and more servers on their own. For example, Facebook data center operations staffers “can manage at least 20,000 servers, and for some admins the number can be as high as 26,000 systems,” reported Facebook Data Center Operations Director, Delfina Eberly. That means that more and more data centers will have their admins working each shift alone. 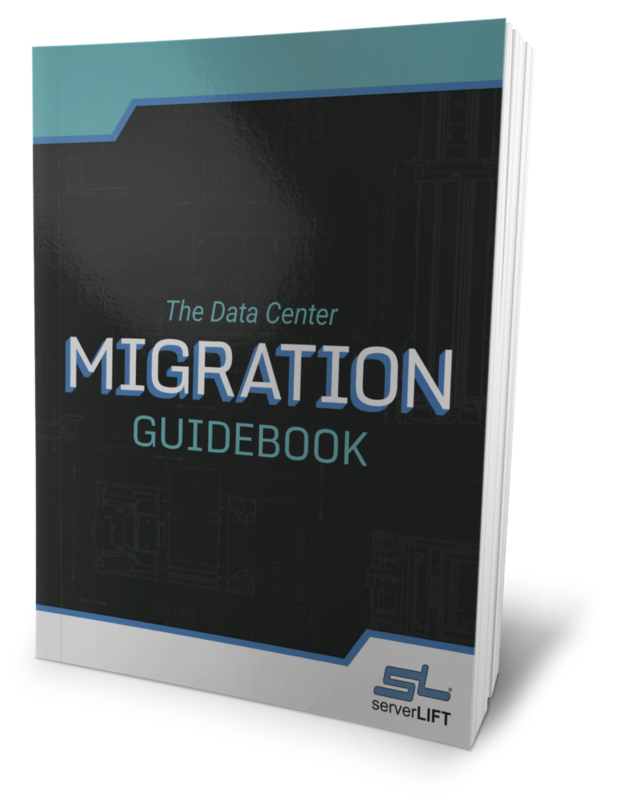 Data center managers on a tight budget want to avoid calling in extra help to migrate or switch out a heavy server. Extra hours, and maybe even paying overtime or holiday pay, won’t go over well with the chief financial officer. On the other hand, risking an employee injury or damaged equipment due to an accident while moving a server won’t go over well with anyone. It’s 3:05 in the morning on a Saturday, and one of your critical servers just went out, knocking out the network or forcing you to run solely on the backup. You have a replacement server, but it weighs over 70 pounds (32 kg). Even with someone steadying it, it’s a bear. The last time you switched this server out, two of your coworkers helped you haul it over to the cabinet, line it up, and line up the rails. You pinched your fingers trying to get it into the rail. Tonight, both of the other techs just got off a double shift because they were migrating equipment to the new data center, and your supervisor worked a double shift with them. You’re the only person in the building. Do you want to call your supervisor and wake him up after he’s worked a double shift? You don’t need to call anyone. The purchasing department delivered a new data center lift just last week, and your coworkers used it this week for the data center migration. When you clocked in, you noticed that even though your colleagues used it to populate a new bank of cabinets during that double shift, it still had more than enough juice to keep going. You’re on it. Before 3:45 AM, the networks’ backup is, well, back up. Your supervisor’s still asleep, and you’re pouring yourself the night’s first cup of coffee. Take a break and enjoy the cup of joe; you’ve earned it! In your data center, you want to keep IT staff to a minimum and avoid dangerous server handling by hand. Make sure that you arm your staff with the tools they need to do their job – a server handling device that they can use in any environment and in any situation to handle server transport, positioning, installation, and removal, without having additional staff on hand. Are Motorized Data Center Lifts Stronger? Both hand-cranked and motorized lifts can handle heavy loads using similar force-generating mechanisms to achieve results. Motorization does not necessarily make a lift stronger, but it reduces the amount of user effort required to achieve the lift. Consequently, there’s something else to think about. Can the lift safely perform throughout its baseline functions and protect your staff from injuries due to overexertion and stressful repetitive motions? Here’s where the motorized server handling device does give users a big advantage over hand-cranked alternatives. A battery-powered motor works faster and longer (and without complaint) than a person can comfortably turn a lift crank. It achieves the same work faster, but with no physical strain on the user. A properly spec’d motor driving a lift system can raise and lower 1,000 pounds (454 kg) in seconds. Because the motorized lift does the work more efficiently and avoids fatiguing IT staff, they are recommended for the vast majority of data center operations. 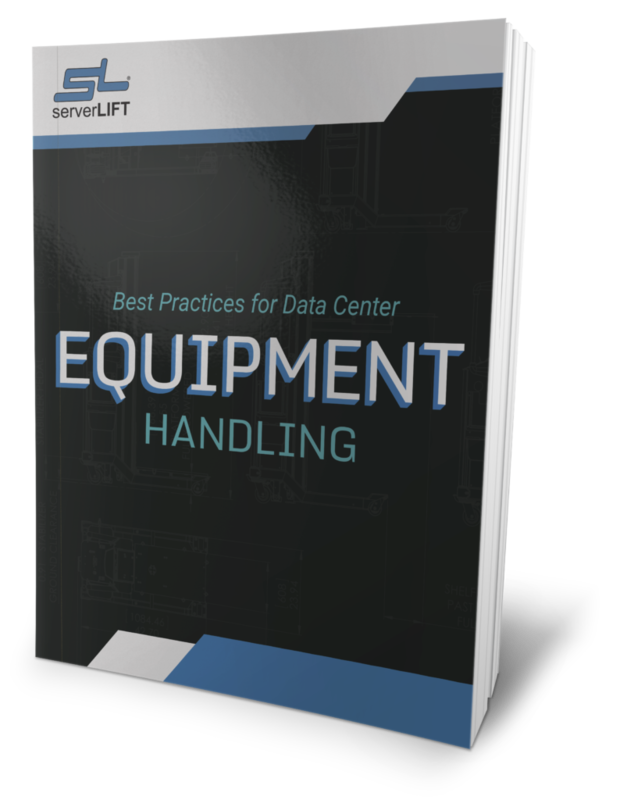 As a general rule, stronger and electrically powered is better when selecting a data center lifting tool. However, smaller operations where IT equipment is rarely added or swapped out can get by, using a lower-capacity hand-cranked lift. Managers should take into account their heaviest anticipated piece of rack-mounted equipment, exceeding that capacity as much as possible to plan for the future. And the heavier the maximum load, the more important it is to use a powered motor-drive data center lift, regardless of how frequently servers are moved. Mechanical advantage only goes so far, and lifting very heavy loads using a hand-crank is not advisable. Buying a single large data center lift that has all your operational needs covered might, in the long run, help avoid having to replace it later on.